Obituary for Merton James Crawford | Qualicum Beach Memorial Services Ltd.
Jim was born in Killarney Manitoba on November 26, 1927. 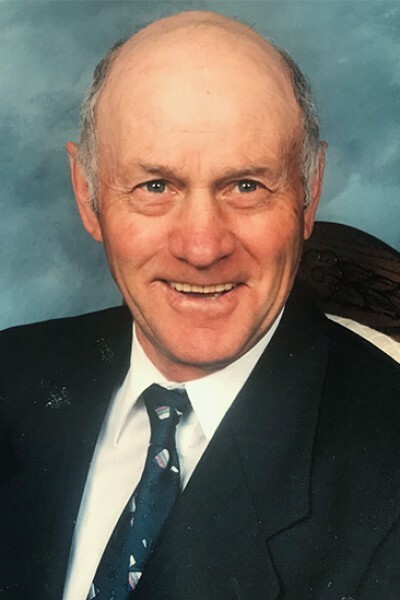 He passed away in Qualicum Beach on March 23, 2019. One of nine children of Allan and Kathleen Crawford. He was born and raised on a small family farm in southern Manitoba, where he learned to farm at a young age. In his early 20’s, Jim left the farm for a few years and worked in the gold mines near Red Lake Ontario. As well as earning a grubstake for his future farm, he became adept at the use of dynamite. This came in handy when it came to clearing landscapes around the farm. After returning from the mines, Jim purchased the family farm from his father. Shortly thereafter, he proposed to his love, Ethel Shirley McMullen. They wedded on June 9, 1951 and have been together ever since. Knowing full well the value of cheap labour, Jim fathered three sons: Brian, Blair and David. Jim and Ethel went on to build a very successful farm business which included raising purebred Charolais cattle, various grain crops and also the big love of Jim’s life, horses. Island life would not be able to take the country out of the boy as you will see. In the fall of 1993, Jim and Ethel decided to leave farming and Manitoba winters (& the summer bugs) behind, and sold the family farm and moved to Qualicum Beach to enjoy their retirement years. A very wise choice, as they have enjoyed many fine years in this beautiful place. Jim was always a big supporter and tireless worker when it came to community service. He organized many charity “trail rides” in both Manitoba and BC. He spearheaded the building of the Killarney racetrack and many other improvements to the Ag Society and grounds. He served on many boards for community fairs, sports and seniors’ care. He continued this in a big way in Qualicum Beach from serving dutifully as a church elder at St. Columba, visiting his flock of assigned congregation members, as well as working with Citizens on Patrol and SpeedWatch BC, to his volunteer work at the Coombs Agricultural Society, island 4-H clubs and judging local cattle exhibitors’ stock. Jim had buddies all over the island (most recently the QF coffee shop gang) as well as treasured family and friends across Canada who will dearly miss him and his influence in their lives. All this is simply a testament to the kind of man he was. He has touched a lot of lives in his time and the world was a better place with him in it. The Springford Farms animals and especially his pride and joy, Princess, will miss him most, but he will now be reunited with all of his special horses, pets and animals he loved and cared for throughout his life. Jim is survived by his wife Ethel, sons Brian, Blair and David, his wife Ashley, grandsons Daryl, Aaron and Kyle and their respective brides, Jennifer, Carly and Kelsey, along with great grand-daughters Jaycee and Emersyn. In addition, Jim is survived by his brothers Mac and Ken and sisters Beth and Jean, along with a multitude of nieces, nephews, cousins and many friends. Jim was predeceased by his oldest sister Ferne, oldest brother William and next oldest Ralph and then Kelvin. More importantly, Jim and his soul are reunited with his brothers, sisters and other extended family now too. The memorial service will be held on Saturday April 13, 2019 at St. Columba Presbyterian Church in French Creek, BC at 2 pm. Jim’s family asks that in lieu of flowers, please donate an “In Memoriam Gift” to one or more of Jim’s favourite charities such as the BC Cancer Society of which he was a big organizer and supporter of the “Trail Rides to Conquer Cancer”, the Oceanside Hospice Society (or your local hospice) and last, but not least, St. Columba Presbyterian Church.